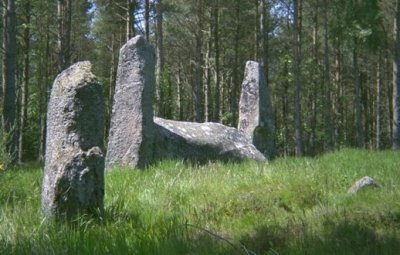 A couple of miles to the east of Keig is the beautiful stone circle at Cothiemuir Wood. At the Keig crossroads turn north onto the B992 Insch road then take the first turning immediately on the right. This scenic but narrow road goes on towards The Lords Throat beauty spot with views of the Don. Just under ½ a mile on the left is Cothiemuir Hill covered in mixed woodland. Stop opposite the track on the left leading through the trees. Follow the track for about 300 m through oaks, honeysuckle and hollies - this place is best in summer - and you'll see the circle ahead in a clearing among firs. This circle is over 20 m across, lichen-covered, carpeted in heather, with seven of the 11 stones surviving and a cist-slab in the centre. The recumbent stone has three large cupmarks on the outer face, perhaps mapping ancient lunar positions. Each tall flanker seems to have been specially chosen for its individual shape, one a broad-based triangle, the other taller and broader at the top - perhaps personifying male and female characteristics.